I wanted to make one of our favorites for dinner tonight – mattar paneer – since R came home after a week of traveling and is about to set off on another week of traveling. Unfortunately, paneer is hard to come by in Brooklyn so I made mattar mushroom instead using shitake mushrooms. I rarely follow any recipe to a tee and believe that almost any recipe can be altered or varied depending on what ingredients that you do or don’t have – so today, mushrooms filled in for paneer. The chewy, earthy taste of shitakes, while completely different from creamy, rich paneer is still quite delicious with sweet peas and the tangy, spicy tomato curry. One of the nice things about mattar mushroom is that it’s a one pot dish – I use a tall stockpot. Chop the onion, garlic and ginger in the food processor. Add it to the stockpot with about a tablespoon of canola oil along with the cardamom seeds and cinnamon stick. While that cooks, pulsate the tomatoes and green chilis until they are a liquid like consistency. I’m an impatient, fast paced cook so there are invariably a few small pieces of tomato which don’t become liquefied. That’s okay – they’ll boil down. When the onions become translucent, add the tomato-chili mixture. This is going to become the “masala” – keep stirring it to make sure the bottom doesn’t burn and cook it until the liquid boils off. Next, stir in the tomato paste. Be careful – the bottom of the pan becomes very prone to burning now! Whisk the yogurt (I use a small egg beater but a fork would do) then add it to the masala. Add everything else from the masala rack. Now is when I try to be really patient and let the masala cook. My mother-in-law, who is super patient (and who taught me this recipe), let’s her masala cook for at least an hour I think – maybe more. As mentioned, patience isn’t my virtue so I cook my masala for about 15-20 minutes (or as long/little as my patience permits) being sure to stir frequently so the bottom doesn’t burn (did I mention, the bottom is prone to burning?). Next, add about 6 cups of water to the masala and mix. Congratulations – now you have curry. Wash the mushrooms thoroughly and quarter them. 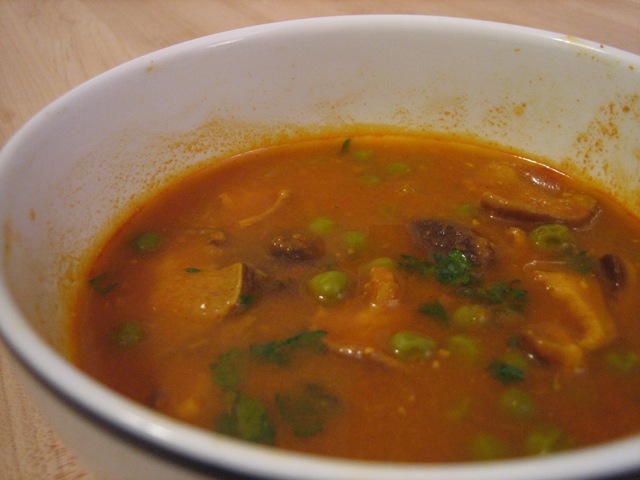 Add the mushrooms and peas to the curry. Partially cover the stockpot and let the curry come to a slow boil. Let the curry boil for at least 20 minutes until the mushrooms and peas are fully cooked. If the curry is too thick or too spicy, add some additional water. If the curry seems to watery, let it boil longer. Enjoy with some fresh basmati rice, a piece of naan and a side of raita. I must admit I was slightly nervous about making this dish. So I had my Bhabhi make it for me. It was delicious. Nithya’s unique taste for spices tempered with an understanding of the modern working male make these meals a real treat. I give it my seal of approval and in fact, will be adding this dish to my shaddi.com profile.